Home | Blog | This Restaurant Is Serving A Gold Covered Burger For Valentine’s Day! This Restaurant Is Serving A Gold Covered Burger For Valentine’s Day! The Meating Ground in Fremantle has created a gold-covered burger just in time for February 14th. 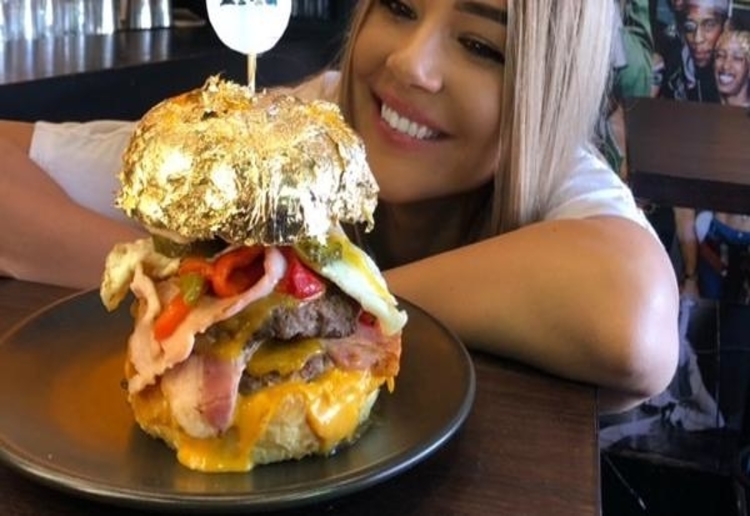 A Perth restaurant is hoping to take social media by storm with their Valentine’s Day special – a burger covered in real gold! Giovanni Pezzano, who owns The Meating Ground, hopes that his latest creation will provide couples with a unique option for their romantic dinner out. The Solid Gold Burger consists of luxury ingredients including double smoked cheese, Johnny Walker Blue Label single-malt pickles, truffle mayo, a 200g wagyu beef patty and $500/kg foie gras. All that luxury doesn’t come cheap, with the burger priced at $200. “I am giving burgers a bit more credibility,” Giovanni told news.com.au. “I want it to be a very social burger, giving all aspects of the burger a special touch.” As for the signature gold coating, it’s not as complicated to create as you might think. “We make our own brioche buns here, so when you put the gold leaf on it, the butter helps it stick.” Giovanni took inspiration from a $5000 doughnut bouquet that he created for a friend’s wedding last year which featured hundreds of Swarovski Crystals. When did food bedazzling become a thing!? Giovanni says this year’s Valentine’s Day creation is only the beginning and hopes to create a $5000 burger in the future. The Solid Gold Burger is already attracting celebrity attention, with Perth Wildcats players putting in their orders for its release on the 14th. Even though you could get an incredible tasting menu or night in a hotel for almost the same price as a single Solid Gold Burger, we’re sure that this will be a hit with Perth residents looking for something a little different for Valentine’s Day – your date definitely won’t forget it! Would you try the Solid Gold Burger for $200? Let us know in the comments! there is absolutely nothing on that burger that makes me want to eat it! There are about a million things I would spend the money on before buying this. Nope! I would spend the $200 on a trip! Um, NO! Why? This will obviously generate a heap of social media coverage, but not for me thanks. The burger looks amazing but to pay $200 is not in my budget and l make fabulous burgers anyway!!! It does look yummy – still out of my range! Definitely not something I would try. I’d rather spend the money on something else. Hmmmm, nope. $200 could get me an awful lot of groceries! Is that much gold leaf ok for you to eat?